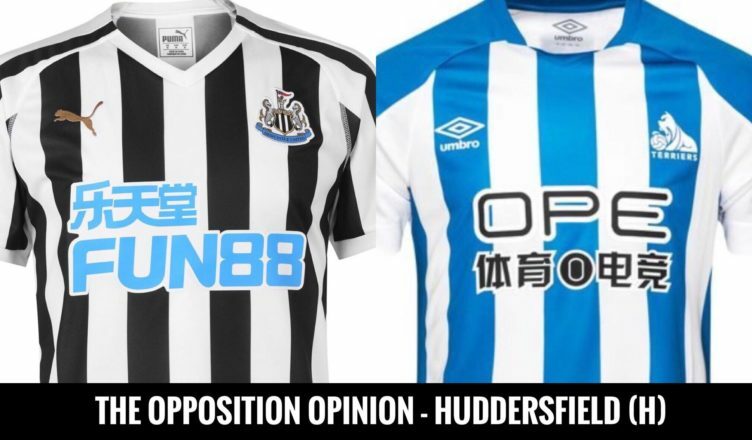 The Opposition Opinion – Huddersfield (H) – “Head says 3-0, heart says 1-1 draw..” – NUFC blog – Newcastle United blog – NUFC Fixtures, News and Forum. We’ve been speaking to a Huddersfield fan this week ahead of Saturday’s big game at St James’ Park, gaining some thoughts from Terriers fan Chris McLyne following his trip up to Tyneside this weekend. Q1) – Is there any belief in your camp that you can stay up? “I’ve accepted our fate – and I think most of our players will have privately. “We’re down and just playing for pride now under the new boss. To be honest though, I’d rather enjoy Championship seasons than put up with what we’ve had to watch over the last year! “The new boss is saying the right things and saying we won’t give up etc., but I think this is just him trying to build any sort of momentum ahead of a Championship campaign to come. “There’s plenty teams in the mix, so we could’ve pulled off the great escape if we had two or three more wins under our belt, but we just can’t score for toffee and aren’t exactly rock solid at the back. “We try, but the bottom line is we’re just not very good and have few quality players good enough to be the difference’. Q2) – Who are the strengths and weaknesses in your current side? Any ‘ones to watch’ that most NUFC fans wouldn’t know about from watching you on Match of the Day? “Aaron Mooy is easily our best player and I’m glad to confirm he is back for this one after missing the game between us late last year. He makes us tick in midfield and is great off the ball too. If he’s poor then you’ll win..
“Billing is another good midfielder and our ‘one to watch’, although he’s a bit too shot happy. Still, he’s a real talent and a player I can see going on to do big things after us…although he needs to improve much more off the ball. “Kongolo, our left-back, is a good player and has the sort of class few of our players carry. He’ll be hard to get past for whoever is playing down your right! “The big weakness is our total lack of goal scorers. We haven’t got anyone close to being good enough at this level up top unfortunately. “Rondon is a beast and will bully our centre-halves. He didn’t get much service in the first game we played this season but he doesn’t half make the most of what he’s given. “I’ve always liked Perez but don’t think he’ll get much change out of Kongolo and I’m intrigued to see how good Almiron is. A friend of mine is hoping and praying he doesn’t start as he rates him very highly. “Longstaff has looked so, so impressive but he’s still inexperienced so I’m hoping this is the game where it all starts to go wrong for him! ‘We’ll go for it. We have to! “I think you’ll keep a good shape and just look to counter us hard as soon as we lose it. “I’m expecting a good atmosphere and a very tough afternoon to be honest…especially if Almiron starts and you get an early goal. Q5) – It’s fair to say both of our clubs are facing a real fight to stay up this season. Which three sides do you see going down & why? ‘We’re gone and I can’t see Fulham pulling off the great escape either. “Palace will be fine, you’ll be ok thanks to Benitez’s class in moments like this and I also think Burnley will be solid enough to stay up. “Southampton don’t convince me at either end, Brighton are in a proper mess now if they don’t turn it around quickly but I think it’ll be Cardiff that joins us and Fulham. “(4-3-3) Dubravka – Yedlin, Lejeune, Schindler, Kongolo – Mooy, Shelvey, Billing – Perez, Rondon, Almiron. A big thanks to Chris for taking some time this week to speak to us. Next up will be the thoughts of a Burnley fan ahead of next weekend’s game at St James’ Park.